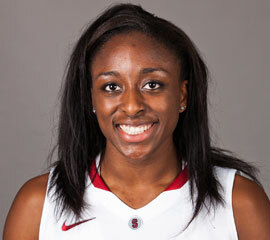 Went to four Final Fours, was a finalist for the Wade Trophy and Wooden Award in each of the last three season; finished as Stanford's second all-time leading scorer behind Candice Wiggins. 2011-12: PAC 12 Player of the Year, All-PAC 12 First Team, and PAC 12 Tournament MOP; averaged a double-double and led conference in scoring, defensive boards and FT percentage. Fourth Stanford woman with 2,000 points, 1,000 boards (Jayne Appel, Nicole Powell, Val Whiting). As a junior and sophomore was named State Farm All-America First Team, AP Second Team, All-Pac-10 Team. 2009-10: Pac-10 Player of Year, NCAA Regional Tournament MVP. Goes by Nneka.